How do Wieringers live in 2015? As in the rest of the Netherlands the population of Wieringen is ageing. While in the Netherlands population growth came to a halt, Wieringen's population even decreased compared with the 1990's levels. An explanation is the under representation of young people in the local population. Many of them have left Wieringen for school and / or work, two things that are hard to find on Wieringen itself. People who come to Wieringen are mostly pensioners who want to spend old age in the place where they were born. All of this led to 4 out of 7 elementary schools closing or merging with other schools. ecause of this there is no real demand for houses on Wieringen. There are sufficient houses to house all inhabitants, there is only a shortage of special, adapted houses for the elderly. There are no large buildingplans at the moment, work is in particularly dedicated to upgrade or replace the existing houses. 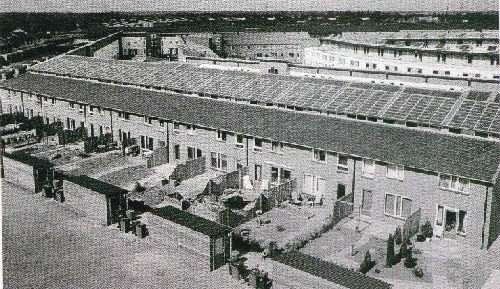 The older houseblocks of just after the second Worldwar are renovated to make them more energy efficient: insulation of walls and windows, solarheating and solarcells where possible. For many buildings such investments are a waste of money, because they have become obsolete: people do not want to live in them any more. Demolition and replacement by modern houses is the only solution. 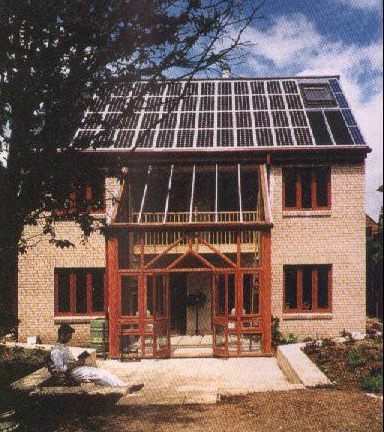 These modern houses are oriented on the south, dug in, equipped with solarenergy collecting roofs and are built from the debris of the old houses (as far as this is possible ofcourse). Because new houses have to comply with newer, different requirements there can be fewer houses built on the same spot. To use the available space as efficiently as possible (so that not the whole of Wieringen is filled with houses), new ways of building more houses on a small area are tried. (see photo below). The leftover debris is broken into small pieces and then used as fillingmaterial under roads. Concrete is used less nowadays in comparison with 20 years ago. Concrete can not easily be recycled. Instead steel frameworks are now being used. Between the frameworks the brick walls are erected. When such a house is demolished the steel can relatively easy be removed and melted to make new steel.